Install latest Corebird in Linux desktop via PPA - Corebird is a modern, easy and fun native Linux twitter client. It has inline image and video previews, and supports multiple accounts. 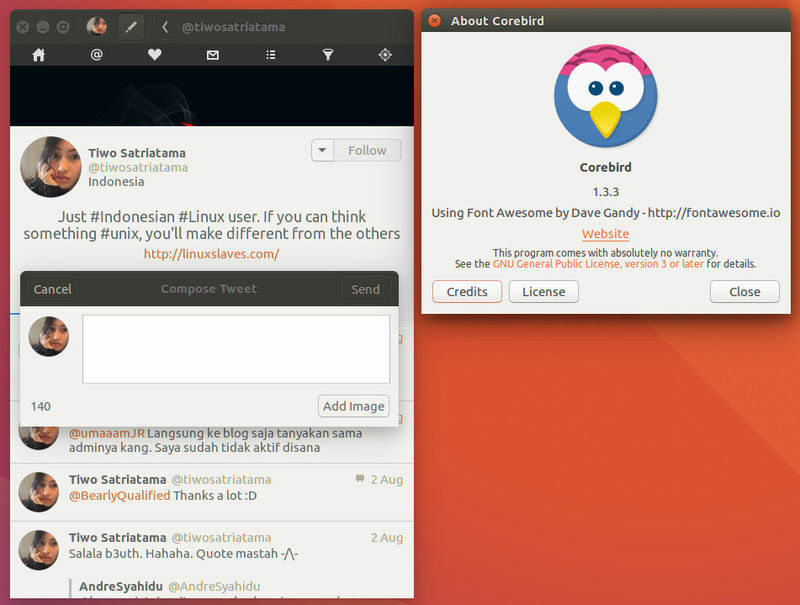 So far, Corebird is nice and one of the best twitter apps available for Linux desktop. Corebird finally reached v1.3.3 with bug fixes. Today I will show you the step-by-step tutorial how to install or update Corebird in Linux e.g Ubuntu 16.10, Ubuntu 16.04 LTS, Linux Mint 18. Use the correct nsfw status of a tweet, i.e. the one that can actually show images. Fix tweet length calculation of quote tweets. This previously led to tweets getting rejected by the server even though Corebird claimed they were fine. Images in quoted tweets now look more like they actually belong to the quoted tweet instead of the quoting tweet. Allow deleting tweets from the tweet info page and not just from timelines. Increase gtk+ dependency to 3.18 to get rid of some workarounds. Increase avatar size in profiles and slightly overlap them over the banner. Also, always show the full banner. You can now open the Corebird from Ubuntu unity's dash and check the version by simply head to Corebird menu -> About. These were all the step-by-step Linux tutorial, how to install and update Corebird in your Ubuntu Ubuntu 16.10, Ubuntu 16.04 LTS, Linux Mint 18. Thanks for visiting us! Via ubuntuhanbook.